When your home suffers from sewage, storm, or water damage, you need to take immediate action to remove the water and minimize the damage and loss, or it will cost you. The key and the number rule of water removal and water damage restoration is not to try and do it yourself because it is a situation that requires a serious undertaking, professional equipment, and expertise that could result in further damage not covered by your insurance company. Doing the water restoration project yourself could cause more significant damage to your home or business than there already was, to begin with, and suffer greater losses if you and if it’s not done correctly, by appropriately skilled and experienced water removal restoration experts. Whatever the source of your water damage might be (be it from rainwater or storm damage, broken water lines, or sewage damage) the next thing you should do as a homeowner is to hire a professional water damage repair and restoration service company to help you handle the situation. These are some categories below which will help you identify when you might have water damage and to call a professional. One of the most obvious reasons why you might need the service of a Water Damage Restoration service is flooding. Hurricanes and floods can destroy your home, and when this happened, a professional service can restore your property for you in no time. You might need not to necessarily replace your carpet if it is stained with wine or soaked with water. A Water Damage Restoration help restore it to the pre-incident condition by drying out the carpet and remove stains. Sometimes the grout between your tiles could become dirty with dampness after a floor or due to water damage. This too calls for the services of a professional Water Damage Restoration company that would clean your tiles or grout without damaging them. Something as simple as a leak from your washing machine or due to a natural flooding incident can have severe secondary effects. These issues can cause mold growth in your living space, and this can be health hazardous. In a situation like this, water damage restoration specialists can help you take care of the mold remediation. You need to call on water damage restoration company that knows the correct and best techniques for solving issues like this with the right equipment. A water damage restoration company offer services such as debris removal, environment stabilization, odor control, carpet cleaning, water extractions removal, anti-microbial spray, sanitation, and many other services. So, if you are looking for the right personnel that can help you fix your flood problems, water damage restoration professionals are the people you should run to. Water damage restoration companies are dedicated to giving you the best clean up services, so you don’t have to worry any longer. A water damage restoration technician are skilled and trained to save whatever has been damaged by the rains, floods or pipe breaks. The best part is even if you have documents, especially your sensitive documents that might have been destroyed by the water it still has a chance to be salvaged and restored. Other special materials or objects may likewise be cleaned and dried correctly by water damage restoration experts. Doing the work of a water damage restoration company can be time-consuming. Your time will be wasted on all the cleaning up and drying you need to do if not done correctly. Hiring a company will allow you to move on to doing more important things and also save you time and effort. Water damage restoration experts have a lot of knowledge about home furniture and fixtures and other contents which you might not know to help restore them. First Response can also help you with special requests as we have procedures and proper training when it comes to restoration to ensure you that we will not cause more damage to your possessions. Professional expertise with the true intentions of getting you back to better than normal. Robert & his crew turned an 8000 sq ft water disaster into an amazing "nice save" in under 24 hours. They were on the scene in under 30 minutes & worked late into the evening until everything was under control. The crew that came out were so nice & professional. Would highly recommend to everyone. Thank you for an awesome job!!! First class service! My only regret was not calling them 4 or 5 hours earlier. Brian, Chris, and team were quick to assess the situation and work with me on a custom remediation plan. They explained everything, including pros and cons of the various options, clearly and completely. I hope I never need this type of service again. But, if I do, I know who to call. Incredible people that are pros at managing risk and restoring peace of mind! Great service, after math recovery was great. With 530 residential apartments to manage, it is a saving grace to have a company like First Response to call in what is often stressful situations. I trust both the speed of response and quality of work. They are truly second to none. I have not had to used their services but I have met their staff and feel very confident they would do what they say they will do. First Response did a superior job of remediating water damage to my home. They were the second company that I called but the only one that I will call in the future. They take their jobs seriously and completely understand the meaning and value of delivering outstanding service. Not only did they correct the problems created by the first remediation company, but they went above and beyond to ensure that their work was done properly and expertly. Robert and Josh and the entire team earn my highest recommendations for service and expertise. May 31, 2012 my husband and I were notified that we were being forced to move out of our home, at no fault of our own. Needless to say, this news caused a lot of stress for us! My employer, Robert Pulliam - President of First Response, understood the emotions I was going through and offered the company's services to assist in the process of moving. He also allowed me the time off needed to prepare for the move. My husband and I worked diligently over the next month to have everything packed up and ready to be moved out. On the afternoon of June 29th, Robert and a couple of our co-workers came to our home and moved everything out. It was such a tremendous blessing to have the extra man-power!! First Response has extraordinary leadership and support staff, and I am certainly proud to be part of such an amazing group of people! 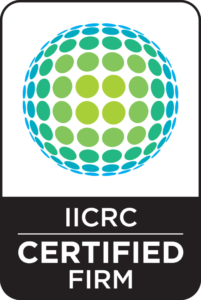 First Response takes our training serious, that’s why we follow the standards of the IICRC for all our water damage restoration jobs. If you want the job done right the first time, without secondary damage down the road, call First Response.